Vivian Morgan Riggs was one of four daughters born to Glover and Mariah “Agee” Morgan. Vivian was born in Omaha, Nebraska on January 19, 1922. She received her religious training early in life. She attended public schools, and graduated from Technical High School. She married her high school sweetheart, Thomas “Billy” Riggs , and they were married for 69 years. Vivian began her work career at Martin Marietta Bomber Plant, during WWII. She contributed to the war effort by building B-29 bombers, she was one of the original “Rosie the Riverters”. For better job opportunities, the family moved to Denver, Colorado in 1947. Vivian started working at the Air Force Accounting and Finance Center as a clerk, and retired as a computer specialist, one of the few black women in that field, at that time. She wrote the programs that we now just push a button to use. Throughout her work career, she was highly thought of and excelled in all of her endeavors, receiving many accolades and awards. She was an officer in the fledgling Equal Employment Opportunity Program and helped many others to achieve their goals. 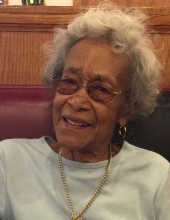 Although her passion was her family, Vivian also enjoyed golf, traveling, gardening and sewing. She shared a passion for golf with her husband, sometimes playing nine holes before going to work. As a member of the Cornhuskers Gold Club, she played at the championship level and won many tournaments and acquired numerous trophies. Vivia was not only a loving caregiver to her husband, until his death in 2009, but also, the main caregiver for three of her four sisters. Vivian departed thi life Thursday, November 15, 2018. She leaves to cherish her memory, one son Thomas (Jack) Riggs and one daughter Billye LaVon Tate. Two grandchildren, Nicole LaVon (Mike) McCabe and Marquis Alphonso Tate; Four great grandsons, Charles Alphonso Tate, TreVon Marquis Tate, Kilian Tate McCabe and Matias Alphonso McCabe. And a host of other family and friends. To send flowers or a remembrance gift to the family of Vivian M. Riggs, please visit our Tribute Store. "Email Address" would like to share the life celebration of Vivian M. Riggs. Click on the "link" to go to share a favorite memory or leave a condolence message for the family.